This is our fourth Indiegogo reward podcast! This is about ball-shaped robots with Frank Welker's voice, Joaquin Phoenix's love affair with said ball-shaped robot, and really dumb motorcycle helmets. Click [HERE] to burn up everyone on the launchpad. 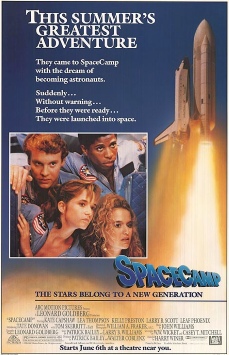 Hurray for another episode letting Mike nerd out about the space program, and another dose of 80s goodness! It was great hearing Nicole's experience with the Challenger disaster. I was almost the same age. My mom was a high school science teacher, and had friends who participated in the "teacher in space" search, so Challenger hit us especially hard. A few years later I even designed a logo for science program dedicated to Christa McAuliffe. I think every 80s kid must have their "Challenger moment." Quick correction: Kate Capshaw is actually still married to Steven Spielberg (you called her his ex-wife). I think the confusion came up because they met during the Temple of Doom production, while he was going through the divorce from his first wife. Space. Space! Space? Wanna go to space! Aw, thanks! I think this is the last podcast where I'll nerd out about space, because Jeremy is getting tired of having his podcast hijacked by me. Good for Kate C and Steven S. The usual Hollywood story is that it was, like, her second and his fourth, and they each went on to have another, you know? It really meant something when the Challenger exploded. I think that was our generation's Kennedy moment; it was the event that showed us that it wasn't necessarily always going to work out all right. And it kind of ended the whole "Star Wars ripoff" genre, too, because nobody wants to be reminded of it.